This Slow-cooked BBQ Pork Ribs recipe will work perfectly either with a pot on stove or a slow cooker. This dish can be served with steamed rice or salad. These are the best slow-cooked pork ribs I’ve ever had. 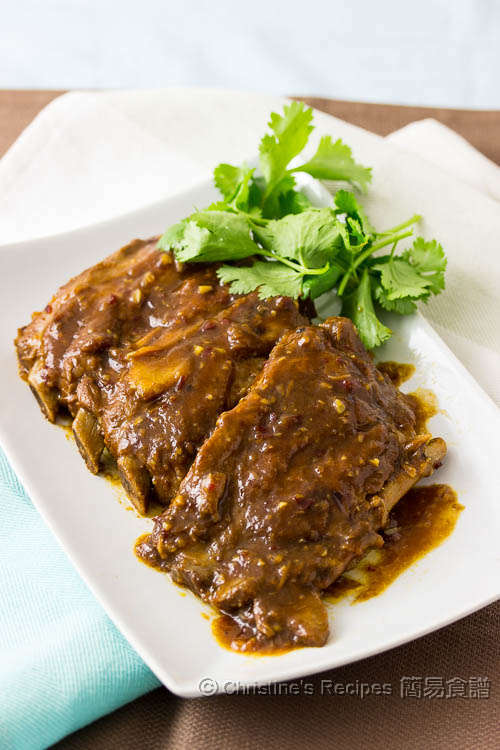 The nearly fell-off-the-bone pork meat with the sweet and slightly tangy sauce will make you want more. The taste is well-balanced and the meat is not fatty at all. With minimum preparation, all the cooking can be done in one pot simmering on stove. If you have a slow cooker, draw it out from your pantry to serve you. Soak the dried chilli in hot water until softened. Chop roughly. Set aside. Cut the pork ribs to fit into the size of your pot. Mix all ingredients with the pork ribs. Cover and chill in fridge for at least 6 hours, or overnight. Remove the ribs from the fridge and rest at room temperature for 10 minutes. Transfer the ribs with the marinade into a heavy-based pot. Pour in some water that just covers the ribs. Cook over high heat, covered. When it boils, reduce heat to simmer until the ribs are softened, for about 2 to 2½ hours. (Remark: If you use a slow cooker, cook for about 4 to 6 hours, no need to top up with water though.) Remove the cover. Turn heat to high and cook until the sauce is reduced and thickened. Serve hot. The power of every stove is very different. Please adjust the cooking time accordingly. Replenish boiling water if necessary while cooking. Towards the end of cooking, the sauce should be thickened and a bit glossy. To get the best results, get sweet navel oranges to make this dish. Yes, this recipe wit work for beef. And any tough meat will turn to be very tender after long hours of cooking. Yr BBQ pork ribs look delicious. Will try soon. Thanks also for the stewed beef brisket with Chu hoa sauce, which I hope to try today. But need yr advise I hv bought the sauce and the brisket. But looking at the brisket I bought from the U.S. Supermarket, I m not sure this cut is same as yrs. it is very lean brisket. Can u pls advise. I just rec this recipe. Thanks Christine for reply. Sometimes I got very lean beef brisket to make the stewed beef brisket too. It's a bliss, no need to solidify the fat then discard it. Save time and energy. Can I use oxtail and shanI as alternative for the stewed beef I earlier asked about. You may use oxtail or shank.They are all beef, only different cut. The taste will be as good as brisket. Great to hear that you had big success on making bread. As for making this dish, you need red wine vinegar, not red wine. It's a kind of vinegar. If it's not handy to you , you may replace with white vinegar. I don't eat much pork, but am sure the sauce would be fantastic with some chicken thighs or wings. It does look very delicious, Christine. Hi Christine - great recipe! Can I please clarify when you said no need to top up water if using slow cooker, did you mean to skip the step of adding water to cover the ribs? Thanks! No need to add too many water in the first place. It depends on the size of your slower cooker and how deep it is. Just add water that barely touches the surface of pork ribs. Pork ribs will release some water and a slower cooker won't lose any water along the way of cooking. You're aiming at getting thickened yummy sauce. If too many water, it will dilute the taste. Hi Christine, I would like to try this recipe. But I do not have red wine vinegar. Can I substitute it with zhen jiang vinegar? The taste of red wine vinegar is very different from zhen jiang vinegar. I haven't tested it with this recipe. But you still can experiment with zhen jiang vinegar and see how you like it. hi christine, I don't have red or white wine vinegar, only have white rice vinegar, is that ok? thank you. White rice vinegar will do as well. Taste-wise, beef shin doesn't work with this recipe. Pork ribs have bones that make the whole dish taste differently. If you find 1 dried chilli too hot for you, you might use half next time. Or remove the seeds inside. It won't taste that hot anymore. This dish should taste subtly spicy, not too hot though. Hi Christine, I made those ribs today. Incredibly delicious. Didn't expect that. And so simple to make. Thanks for the recipe. Yeah, this dish is so amazingly delicious. Glad that you tried it. Can I use oyster sauce to replace BBQ sauce? Thanks for your lovely recipes! You can. Oyster sauce tastes differently and saltier. Adjust the amount accordingly. I feel like I needed to add a lot of water to cover the ribs and now I'm afraid it diluted the taste. I'm one hour into cooking and it doesn't have that dark colour that u have in your photo. Did you add too many water to cook? If the sauce is too much and diluted since too many water is added, you may drain out the ribs, and then cook the sauce and reduce it to the right consistency and colour. Can i use a pressure cooker method for this recipe. Sure, you can make this dish in a pressure cooker and cut the cooking time a lot. Feel free to test the optimal cooking time to suit your machine. Can I use black vinegar instead ? Haven't tested this recipe with black vinegar. But I think it works too. Must I blanch the pork ribs before marinating. I didn't. I used fresh pork ribs. 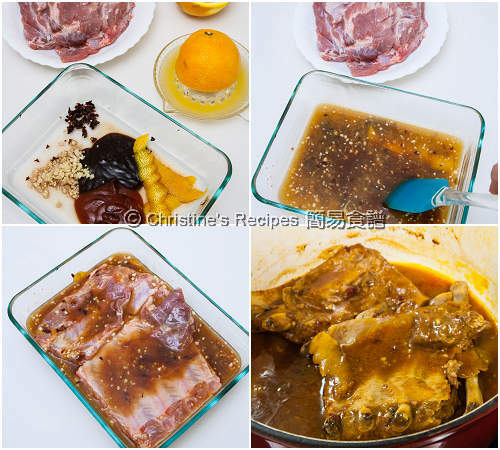 The meat of pork ribs will shrink and become tough after blanching, not so good for marinating. Hi Christine. I have cooked the above using pressure cooker method but it doesn't turn out to be tasty, I don't have red wine vinegar so I replaced with apple cider vinegar and using high pressure for 20 mins. It is tasteless, I even brown them before pressure cooking and I didn't add any water or blanched them before hand as you earlier mentioned. Please tell me what I did wrong. Sorry for hearing your bad experience. This slow-cooked dish was really tasty. The pork ribs should be totally submerged in the marinade in order to absorb all the flavours. You won't lose any water if using a pressure cooker. 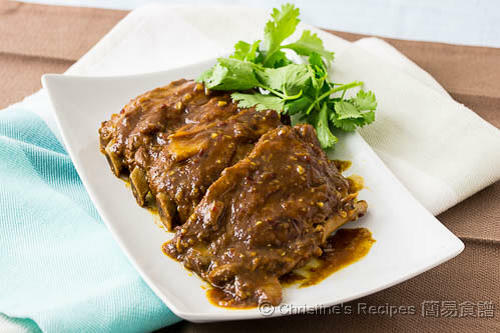 After your pork ribs are cooked until softened, you need to reduce the sauce until it becomes thick. Then the taste will develop and become rich.